Welcome friends! If you are visiting from Jones Design Studio a special welcome to you! Today is a fun day because I get to tell you about an amazing book and offer you a chance to win an incredible giveaway. Melissa from The Inspired Room has been a blog friend for the last 10 years. When I first started blogging, she was one of the bloggers I most admired–and that hasn’t changed over these many years! 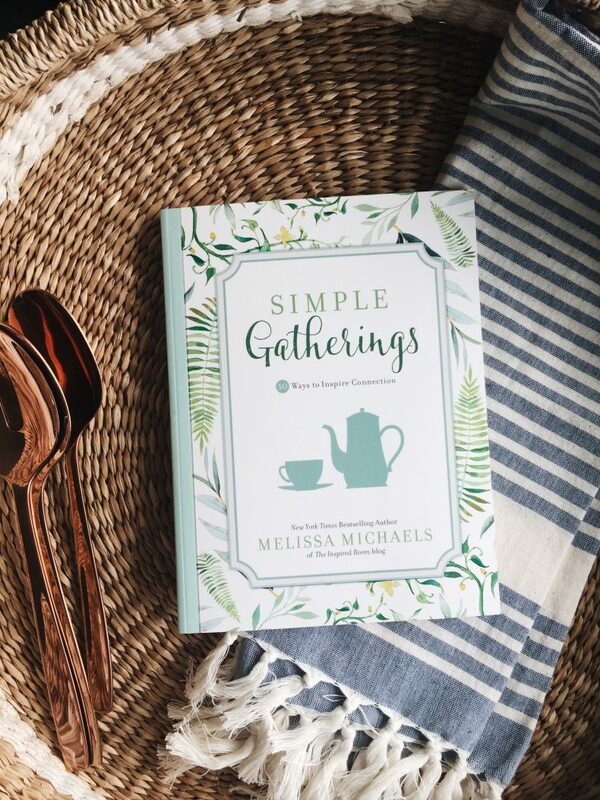 Melissa has a new book out called Simple Gatherings which speaks right to my heart. If you love the idea of entertaining, and want some creative encouragement on how to do so without stress or perfectionism, then this book is for you! You can purchase the book at Barnes & Noble, Christian Book, or on Amazon using my affiliate link here. To celebrate the launch of her book our group of five bloggers are hosting a “Progressive Launch Party” with FIVE separate giveaways, each hostess is giving away a unique set of prizes to a lucky winner! You could win more than one, so be sure enter them all. Melissa has a light-hearted quiz to help us find our “hostessing style.” I took the quiz and had to laugh at my results. The Perfectionist. Ha! Guilty as charged! I admit that I often get so wrapped up in the beautiful details of entertaining that it interferes with my ability to just enjoy myself as a hostess. I love setting a gorgeous table and creating amazing food, but all of that work often leaves me feeling weary by the time the guests arrive. The thought of all of the work involved frequently paralyzes me from extending hospitality in the first place. During our recent move, I was reminded how silly it is to put so much pressure on myself when entertaining and what a barrier it creates to connecting with others. We were days away from the moving truck’s arrival, and I was exhausted from packing up the house. The last thing I wanted to worry about was dinner when I had just packed up all of our pots and pans. Our “twin row home” neighbors asked us over for hamburgers, and I’d never been so grateful! As a working mom with twin toddlers and a preschooler, her home was far from perfect but that did not matter to me one bit. The food was humble and amazingly delicious. She even went out of her way to make my Homemade Blueberry Mint Lemonade Recipe for the occasion and the thoughtfulness of this gesture was touching. It was the perfect meal, and I was honored to be in her home with her family enjoying a meal together. My hosting style is Perfectionist, but I’m working to change that. I am grateful to Simple Gatherings for the reminder that hospitality need not be stressful! In the spirit of hospitality and to encourage you to host your own simple and stylish shindig, Melissa is giving away FIVE different prize packs. One prize pack is featured per blog so be sure to visit all of the blogs linked at the bottom of the post and enter all of them for a chance to win. Follow the prompts in the Rafflecopter widget below in order to enter. Once you’ve entered my giveaway, be sure to visit everyone in the launch party to enter all of the giveaways! If you started at Melissa’s blog, your next stop after me is Sandy at Reluctant Entertainer. Good luck friends! I love being able to sit back, relax and chat with friends. Love all of these cute prizes!! I need this book! It looks beautiful! I love thi!! I am a perfectionist, but do try to consciously not be as uptight about having people over! Nailed it and I am the social butterfly! I love to host parties and do year round here in gorgeous coastal south Florida! My style is casual, chic fun..generally al fresco..rooftop under the stars, at the beach or pool side BBQ. I prefer smaller gatherings..but, will host large family holiday gatherings too. I want to have fun..and ensure my guest do as well. I think coming together for a friend that got a promotion or achieved something is fantastic. I got Nervous Nester. Ah! I love to host but do get nervous that things are perfect and that everyone has fun. This book looks so sweet! Thanks for the giveaway! Great prize pack! Thank you! I like everything to be well thought out in advance, then perfectly organized. I like to do a lot of planning so my parties are usually very organized. I am a perfectionist. Thanks for the giveaway! I like the Prize! I am always very nervous about hosting get-togethers but these goodies will make it easier. I am a “Social Butterfly”. I feel like I was a perfectionist when I was younger. Over the years I have accumulated some hosting essentials that making throwing a party together last minute a little easier. I could use the book, Nervous Nester here. I am a Nervous Nester. I so need this book! Hard-won carefree and laid back after years as a perfectionist. And always thankful for the reminder to keep my eyes on the simple heart of the matter. Love your blog! I too am a perfectionist, so need to chill! I always tend to bite off more party projects than I can chew, being a Perfectionist! Those golden serving spoons are beautiful! The Perfectionist thing – challenges me to relax and focus on enjoying my guests instead of fussing over details. My friends and family enjoy each other and gladly go in search of whatever they need. If I don’t intentionally relax, I’ll miss my own gathering. Thank you for your lovely blog and the beautiful giveaway! Social butterfly. Interesting…Not at all how I picture myself. Time to embrace a new side of me! I guess I’m perfectionist, but I don’t feel like it! I think my easy breezy style of hosting makes people feel welcome and comfortable at our gatherings. I love that cake stand! I need to learn to be less stressed about hosting. Naturally, I’m a Perfectionist! I hate the pressure I feel when I have guests and it keeps me from having people over. The quiz was fun. I need to invite people over more. Feeling inspired. Your home is lovely! Thank you for doing this! My style is simple, comfy and eco friendly. We entertain a lot. I try to focus on one show-stopper dish and fill-in the rest. Easy Breezy, but, I might retake the quiz. I don’t usually feel Esdy Breezy when I host, more like nervous and frantic! My hosting style is “the perfectionist”. I too am a perfectionist, and it does hold me back. but I am a planner and enjoy the details. Thanks for the chance to win! 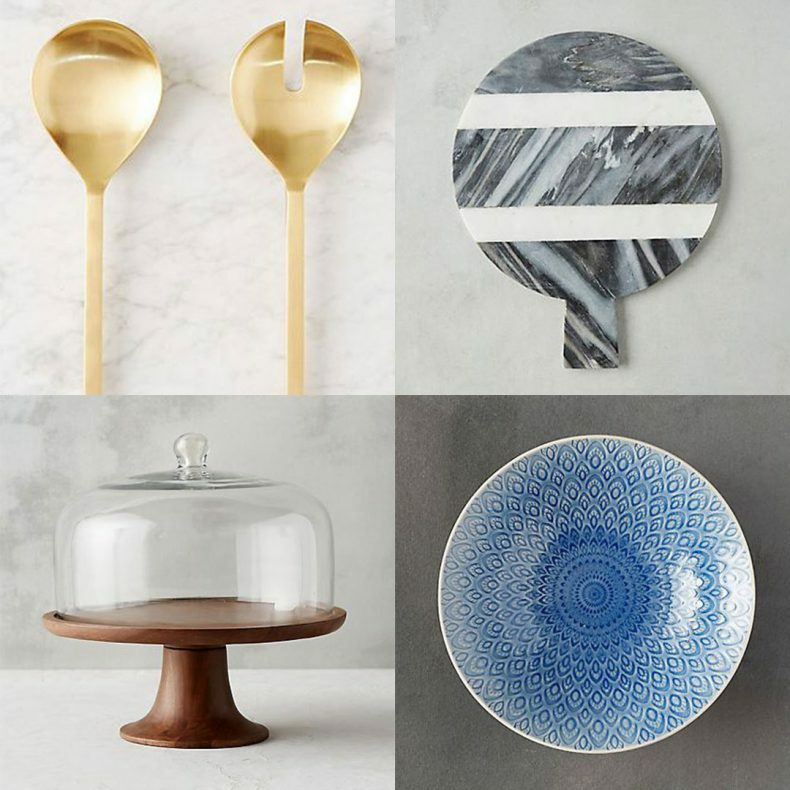 That stoneware bowl is gorgeous! I liked your story about your neighbor… she sound s more like how I throw “parties” or invite people over. Wish I could steal a little bit of your perfectionist /attention to details personality. Beautiful blog. The quiz said that I was a perfectionist butI’m more nervous. Although, i do want things to be perfect, I’m trying to be a little bit more relaxed each time! As a Nervous Nester, I almost always talk myself out of hosting a party. Thank you for this giveaway! So like all these blogs! I’d rather go to a party than host one, but I do like to host family and close friends. I plan everything way in advance and don’t like to leave anything to chance. I am trying to relax a little more and not be such a perfectionist! Since I am a Perfectionist & I have lists it does take several days to get ready. I’m a nervous nester so I end up getting too overwhelmed before I actually even plan anything or invite anyone! i feel a little overwhelmed myself when wishing to get everything perfect and if it is just an intimate gathering with true friends, we have so much fun and laughter, when the outsiders are invited I worry whether there is not enough food b/c I am uncertain how much other people tend to eat or expect at “gatherings”. Dinners are more fun because we have so Much Food! I like everything to be “just so” therefore I started planning weeks out for the right menu, mix of guests, etc. I’m a Social Butterfly. I love any occasion to gather friends and family together for feasting, fun, and conversation. Love your post and I feel the same way. Nervous Nester here. What beautiful giveaway items! Social butterfly, I love to bring my different friend groups together over a simple meal or special occasion. I’m often in our kitchen restocking and refreshing, but then most of my parties end up in there too! Just show up is my style but Melissa defines it as “Easy Breezy”. Either way, we always have fun! I like to be very organized and detail oriented. I got easy breezy which fits me…. my guests know where to restock whatever they need! Nervous Nester, but also think it comes from being a perfectionist. I suffer from anxiety, so I’m too scared to host! I’m hoping that the newsletter will ease my nerves and give me the confidence to host a party soon! I really, really want to! I’m a nervous nester, which impacts my gatherings because I get anxious about making sure everything is right. Perfectionist. Great planning strategies and ideas!! I am an Easy Breezy hostess! Those would help my next party! As of late – KISS method is my friend! Great post My friend…Love Melissa – met her and got to know her at Relevant ( I think that was the one)… Enjoy the day! Also a perfectionist. Hi from JDC! I’m enjoying being introduced to new blogs…and the chance to win this giveaway! I am social butterfly. I may agonize over party prep but I also make sure to have fun at my own party! My style was nervous nester and sometimes I worry too much about having everything perfect that I don’t enjoy the ability to host! What a great remainder that our homes don’t need to be perfect to show hospitality! Thanks for that reminder. I know we can put too much pressure on ourselves for perfection. I have tried to learn that I need to call things good sometimes. Great way to celebrate the launch of Melissa’s book. Lovely giveaway items! I am a perfectionist and it hinders me from inviting people over easily…. I think this book will help! I’m a perfectionist and it hinders me from inviting others over easily…. I think this book will help! I need this book! I also got perfectionist! On the journey of letting go of my Perfectionist tendencies too Beth. Glad to be introduced to your pretty blog. I am not surprised, but I got Perfectionist. I love love hosting a party or get together and love to create tablescapes and decorate for every holiday or occasion. I tested as Easy Breezy but often have to fake it till I make it. I have found you can run out of food and order pizza, run out of beer and send someone to gas station to get more, have not enough chairs and people are happy to sit on the floor or blanket but you have to be welcoming and relaxed or the party will be a dud. P.S. LOVE that Sunburst Stoneware Bowl! my style is easy breezy. I like guests to be comfortable. I can get worked up right before a party though! Hi, Beth! This is a wonderful way to celebrate a new book! Hospitality is our theme this year at church….we definitely need more of it. And it doesn’t need to be complicated. Just genuine! I love this set! Thanks for the chance to win. Nervous Nester…hmmm. I like hosting but I guess I do get a little frantic. This is a fun giveaway! Lovely prizes! Thanks so much! This is great, I love get togethers, hate the stress! I love the OUTDOORS so my decision to entertain depends on the weather. Total Nervous Nester. I hardly ever host anyone for anything… maybe once a year… because I’m afraid nobody will enjoy themselves – if they even bother to show up – and all anyone will think is how boring & lame it was to visit me. On the few occasions I do have company, I have great ideas but spend the whole time worrying & it shows. Hopefully I can improve my confidence with the advice in Melissa’s book. Thanks for the giveaway! This Perfectionist works so hard she rarely enjoys the party. Thanks for the giveaway! I can totally relate to this blog post. I too am a perfectionist and I’m trying to fight it. Im an easy peasy kindy hostess and a social butterfly too … I love having people over for simple gatherings…. this book sure lists the simple steps to accomplish this. Easy Breezy for me but I still enjoy the details of putting together a fun party! Nervous Nester…appparently I would benefit from this book! I am a Perfectionist hostess style. I definitely get too wrapped up in the details and usually end up not getting to really enjoy the party with my friends. This is something I would like to work on so I can relax a bit and enjoy my guests company. I am the perfectionist and I get too wrapped up in the details and don’t enjoy myself at parties I host. “Easy Breezy”! Love the book launch party! So fun! I got Social Butterfly. I don’t like to miss out on good conversations at the party! I got Perfectionist. I find sometimes that it’s hard to enjoy a party because I’m worried about all the details. I find I always have to take a step back and breathe. My survey came back as Social Butterfly. We just finished a kitchen reno where I insisted that a wall be blown up between me in the kitchen and the rest of the world! I guess there is some truth to that survey, although I also lean toward that perfectionist bent! Easy breezy– but a little nervous too! I try to remember to have fun planning and hosting party so others will have a good time too. I’m a perfectionist also. Sometimes it’s good to be reminded to be in the moment and focus on Thebes’s people instead of the details of the decor! Ugh, total perfectionist! Not surprising, and it’s something I need to work on. I love to-do lists and I’m exhausted before my guests even arrive. I stopped hosting last year for that reason and others. Maybe this will inspire me to ease back into it. I like the idea of sharing a meal, with no fuss or expectations, just good company! I am a perfectionist too! I like everything to look just so, but I try to relax and just enjoy the party too. I’m excited to read the book and get some great ideas. Thank for the giveaway! Easy breezy…party on the patio anytime! 😉 Love Melissa’s style! Thanks for the giveaway! I’m a perfectionist, which works well because I work as a full-time event planner at my alma mater! I love every minute of it…and every list! I am with you, Sarah! I worked special events and weddings while in college and I embrace that the lists and the little details to surprise my guests are part of what make hostessing so fun for me. I got easy breezy but I know that I am also a perfectionist! I love the prizes you have chosen. I’m a social butterfly and this is correct, but I’d like to become more easy breezy! I can’t wait to read this book, it looks great. Nervous nester here. Maybe the book can help me?? I got easy breezy, which is pretty accurate! I’m a Nervous Nester, so I’d really like to have more confidence and have the confidence to invite people over more often! Nervous nester – When hosting any kind of gathering, I get nervous about my ability to entertain my guests. Last year, I almost canceled Thanksgiving at our house, on Thanksgiving Day! Fortunately, my mother-in-law stepped in and made it a successful event. This new book will give me tips to hopefully feel more confident about having people over. Perfectionist–sadly, that’s me. I get so stressed prior to that it inhibits me from wanting to host. I need this book! Being a perfectionist, I often get in my own way, creating more stress than necessary. Maybe I can learn to relax and enjoy. Well I am a nervous nester, sounds about right, I have not put together too many parties, I would love to put together a few and I think my confidence would grow! Apparently I’m Easy Breezy and tho it surprises me, it’s true in the sense that I don’t freak out about the state of the house when people come over unexpectedly as much as I used to. I do what I can in the time that I have but try not to use up all of my energy so I have enough to enjoy the guests when they arrive. Love your site. I’m a nervous nester and I’m looking forward to reading the book. Love the good neighbor’s simple but memorable hamburger treat. I pray for the virtue of charity in meditating on Mary’s visitation with Elizabeth when I pray the Rosary. To me, this post exemplifies that perfectly. Thank you. Unfortunately, I’m a perfectionist. I’m trying to embrace it and grow from that spot instead of trying to be someone else! The book looks lovely. Always looking for ideas to make parties and gatherings a breeze. I love what you said about looking up to your mom as the “queen” of hospitality! My mom is the same way! I feel like I have learned so much from watching her. I continue to learn so much from blogs like yours! It reminds me that we can create beautiful spaces with lovely food that STILL seek to place people as the most important part of every gathering! Thanks for all you do! I got the ‘perfectionist’ which is so true!!! But I love entertaining in my home and it has taken years to learn to accept imperfection and invite people over impromptu, Which for me in more relaxed. I’m a Nervous Nester and worrying about everything gets in the way of enjoying things. Loving getting to find new blogs through this launch! I’m a “Perfectionist” also, so I’m working on just enjoying the process of hosting and letting the little things go! Nervous nester, I’m always worried about everyone having a good time. The test said I was The Perfectionist, which I wish wasn’t so accurate. I tend to put off having people over because everything needs to be better…me, the house, my cooking skills, my time organization, schedules. We recently invited over another family with young children, served take out pizza and let the children run wild in the backyard till dark. It was amazing and fun! I need to do more of that kind of entertaining and parties! I got Nervous Nester and this book is probably perfect for me to learn to be more relaxed about hosting. I so want to be a relaxed, come as you are host, but I’m not. My guests can come as they are, but I must have lists and be super prepared. I have a love/hate relationship with parties–love to plan them, love to clean and decorate for them, but worry incessantly about people’s comfort, conversation, how the food tastes and whether I’ve truly blessed anybody! Arggg! I just wanna have fun! This is a fun way to find new lifestyle blogs! I am a Social butterfly so I enjoy parties! How fun and what a great idea! Especially as we plan the holiday events! What a fun day and beautiful blog you have! I am a nervous nester and thanks for hosting this give away. Glad to have a new blog to read also! I must admit as a perfectionist, I am always exhausted after hosting a party. Ways to ease the stress of hosting would be most welcomed. I am having a blast with this launch party. so much fun! I am glad to be introduced to these new blogs (new to me). I am looking forward to receiving the Home Stories emails. Love your table decor! I’m a party perfectionist too. I am definitely Easy Breezy. A good, basic menu and plenty of drinks is all I need for a good gathering. I’m a Nervous Nester! I want to host, but always feel stressed about it. I love the Golden serving set! I enjoy smaller parties, because it’s easier for me to give people the attention they deserve, while I can still enjoy the party & have a good time. This book would be a blessing. MY “Nervous Nester” type keeps me from hosting frequently. Part of my “nervous nesting” has to do with perfectionism. Hoping to change all that with this book. I laughed when my results were perfectionist, because that hits the nail on the head1I often get so wrapped up making sure everything is perfect, that I don’t enjoy the people as much as I should. Being a perfectionist prohibits me from truly enjoying the gathering. I exhaust myself trying to make the perfect party. I’m working on it! I am a perfectionist- which is no surprise. This definitely leads me to go a bit over the top sometimes, but fortunately, I have a family that reminds me to let go of things when i start to get too stressed. Easy breezy hostess here! I love the impromptu gatherings. This is so fun! Thanks for doing this! I love setting everything up for a party, but then I can be more behind the scenes during the actual party! Can’t wait to get my copy of the book! I fall into the perfectionist trap too, but with children I’ve been forced to lighten up and enjoy the parties more! My hosting style from the quiz isn’t accurate. I’m not ever nervous. Beauty that invites rest is what I want people to experience in my home. What an awesome gift! I’m a perfectionist too, and I’d love tips to relax a little more! I can’t wait to read this book!! I love making people feel loved! I am also a perfectionist! Beautiful blue bowl. Thank you for hosting the giveaway! What a fun idea this is! All these giveaway are gorgeous!! Perfectionist because I do love to incorporate personal details to make a gathering special…even though it’s the people that matter most to me. My hostessing style is easy breezy. While that is true (I don’t even plan a gathering if it can’t come together quick and easy) I related to your comment about being paralyzed by the thought of too much work! I rarely host get togethers because there is so much work to it! My hostessing style is “perfectionist” and I could have guessed that but I do think over time, being married to my extrovert husband, I have learned to loosen up quite a bit and tend to be a lot more flexible. As long as I have food to share, I’ll take out what I have. No need to fancy it up. I wish I had a hosting style – my house is too cluttered to entertain! I’m definitely The Perfectionist, and I think it’s an area I could work on so that I enjoy hosting a little more! The Perfectionist… totally nailed it! Nervous nester…Even though guests always have a great time. The quiz says: social butterfly, but I feel like a perfectionist – until the guests arrive! Nervous nester for me, and yes, that can make things difficult. I sometimes avoid hosting, or can’t really relax during it, but I’m getting better. I got easy breezy twice! Let’s hope that how I come off to my guests- inside I feel like a perfectionist and nervous nester based on the comment descriptions im reading here. I’m easy breezy, surprisingly! Thanks for sharing. It pegged me as the Perfectionist, which is spot on. I worry about every little thing–hosting an event is very stressful for me. I’m trying to get out of that habit and enjoy it more. Funny. I’m a perfectionist. It says I’m exhausted after and it takes me a while to gear up. I’m always looking ahead to the next gathering though. still super excited to check out the new book! can’t wait to get this book. it looks like a fun read. I tend to be more task oriented. Would love to be able to sit and enjoy people and conversations. Took the quiz, I’m a ‘Nervous Nester’ which doesn’t surprise me. 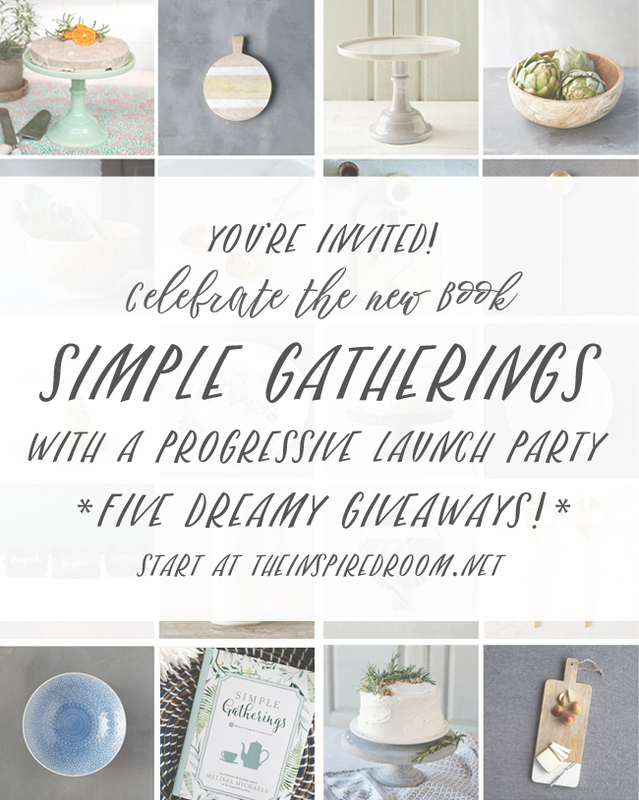 Simple Gatherings sounds like my kind of book and your giveway items are wonderful. Yep, the Perfectionist in me cringes to give a party less than 6 weeks in advance. We love hosting friends and making new friends. Thank you for sharing the book and the beautiful give away. What a great giveaway and a fun quiz. I would love to win to help with the holidays! I always have everything perfect in the beginning, but then I get to talking with my guests and forget to keep things in order – such as making sure food and drinks are properly stocked throughout the gathering! I always get in a nervous tizzy and end up not having a good time because I want everything perfect. I got the perfectionist…and its spot on. I’m always too nervous to enjoy the guests, I think it is my controlling tendency. I’m always too stressed to enjoy! Melissa seriously has been like a surrogate mother with her blog and books for me. My mom doesn’t really do any of this kind of stuff. So figuring it all out and wanting it to be perfect freaks me out. I often wear myself out and just can’t think about it once the gathering starts. I get too stressed before company comes so I don’t enjoy my time with my guests. I need to go with the flow and make memories. This giveaway would be great for me!! This is fun! Love the giveaway items and the premise of the book. While I would love for things to be perfect, we go with more of a casual fun style. As long as our guests are happy and fed, the event was a success. Nervous Nester, here. I am always a little anxious about hosting people but my heart is always so full after everyone goes home. I never regret saying yes to hospitality! I look forward to reading this book! I am the social butterfly but probably border on the perfectionist! Yes! Being too focused on details definitely inhibits my ability to connect with my guests. im a nervous nester and part perfectionist! looking forward to reading the book. I love to throw gatherings I am a perfectionist and everything has to be perfect drives my husband totaly nuts. Great giveaway I love reading your blog. I am The Perfectionist and can find planning a party very overwhelming as I get craggy up in all the details. Melissa’s book looks like a fabulous read that would offer me direction as to how to be hospitably and enjoy it! Since I don’t feel like hosting and “having all my ducks in a row” is my expertise, I typically don’t host as much as I would like. I want to embrace just welcoming people into my home–whether it’s perfectly clutter-free and well-decorated, or not! What a fun giveaway! Looks like a neat book! Oh Beth, I’m right with you! Perfectionist! UGH! I am definitely much more relaxed than I used to be, but I still get caught up in the details and wanting things to look… well perfect! I’m Easy Breezy so I prefer last minute drop-in type gatherings. If I have a function that’s on the calendar for weeks I tend to over think everything and I get so stressed. I got the Social Butterfly on the quiz and it fits me just right. Ensuring everyone is happy and entertained is my goal and that I participate instead of having things to finish up during the event is not my style. Social Butterfly here! I am very comfortable entertaining in my home! Good thing as I was a military spouse of 30 yrs! Thanks Beth for the opportunity to win these beautiful pieces! That 2 tone marble board is beautiful! Good luck everyone! Nervous Nester. I really want people to be comfortable and enjoy themselves, so I tend to overdo it and stress out. I’m a perfectionist! Lists are my best friend. I really should loosen up. I have to be grateful that I love to entertain and I do it very comfortably. My mom freaks out when she’s having anyone over to the house, and I am completely the opposite, always have been. Does that mean I don’t give the house a good cleaning before a dinner party? Of course not! My house is always fairly clean and tidy but it always gets a spruce up before guests come over….the music is playing, the candles lit, and I choose a menu that allows me to be with my guests rather than spend the whole time in the kitchen. My little mountain top home may not be large or fancy, but it’s warm and cozy and welcoming, and my guests always feel comfortable and welcome….that’s the most important thing! My hosting style was Social Butterfly and this couldn’t be more true. I am always running around talking to everyone. I am easy breezy. I love beautifully hosted events, but just want everyone to be comfortable. I am an Easy Breezy according to the test because I love focusing on the people. In the prep, I tend to be a Perfectionist, which can sometimes create an unnecessary amount of stress and stop me in my tracks. Oh my Goodness! That blue bowl made my heart skip a beat. It is truly beautiful in the greenish color, too. I may be adding one ( or three) to my Christmas list. Ha I laughed when I saw your were trying to not be a perfectionist 🙂 I feel like a perfectionist would have the perfect type of get together! And not a thing would be forgotten. It’s all about the FOOD…and the fellowship it brings. Social Butterfly for me on the quiz and that describes me perfectly. I love having everything done way in advance so that I can MINGLE, MINGLE, MINGLE with everyone attending the festivities. I got Nervous Nester – I think that’s accurate because, while I love to cook, clean and decorate, I always feel some “entertainment” anxiety about if peopel will have fun or not! Nervous Nester describes me perfectly! I need to learn to relax and enjoy the party!! I love sharing our home, we are so busy and I want everything just right that we don’t share as much as I would like. I got Nervous Nester, but I think I lean more towards Perfectionist. I’m trying to be more relaxed, but I’m quiet and would rather have just a few people over and have good conversations than a big party. My perfectionism often lends to a stressful ramp-up for parties but they turn out so well, I don’t argue with my instincts! I got Social butterfly, and it is spot on. I like to have everything out and ready before my guests arrive so I can mingle instead of being stuck in the kitchen. Conversation is my favorite part of any gathering. This book sounds like just what I need! I took the quiz and the results said that I’m a perfectionist, which is probably a little true, haha. I just want to make sure that everyone is fed and happy, but it takes a lot of work on the front-end to make sure that happens. The results are definitely worth it though, and I love having people over! I’m not sure how but I got The Perfectionist … no wonder I’m stressed out when we have people over! Must work on a more relaxed attitude! Hi Beth! I was sorry to be called out as a Nervous Nester. But it’s true, I sometimes don’t bother having the party because I don’t want to leave anyone out or fear it will be a dud after a lot of work. i think my hosting style is casual which helps keep the party relaxed and easy going. I was a little surprised by my results but I’ll have to think about it more and I’ll probably find that in some aspects it’s true. I love all 4 of these items. They’re all so pretty (and useful). I’m the nervous nester. I’m afraid I’m going to get it wrong or people won’t feel comfortable. It’s always something. So I try to avoid it all together. I’m hoping to get better about it. Thanks for the chance to win! Love Melissa’s simple styling tips! I am a Nervous Nester. I’m sure that impacts my hosting. I want things to be as perfect as they can be. I worry that my home is too small, it’s not as nice as my friends homes, people won’t have enough room to spread out, or maybe people won’t show up. All things I know I shouldn’t be concerned about. I run around picking up after people. I always try to keep it as tidy as possible. I wear myself down in the end. I love your table in your photo. Did you paint it yourself? What a fun giveaway for a book launch! Yeah quiz was so fun too! Oh dear – I am also a Perfectionist, but would REALLY like to be able to change that and lighten up a bit. Love these giveaways! Thanks for the chance to win! I’m a Perfectionist so I get overwhelmed with preparation for my gatherings. I got the Nervous Nester, which YES. I am too worried that people wouldn’t come and my house is too embarrassing that I just don’t host anything anymore! I am a work in progress. I tend to be a perfectionist, but the more parties we have the more relaxed I become. I’m the “laid back” hostess according to the quiz, although I’m usually more concerned about getting the house clean and ready than the food or decor. I got Social Butterfly on the quiz and that definitely defines my parties. I love decorating with a mixture of store bought and DIY items. I love ensuring everyone is mingling and having a fabulous time with eating and drinking and eyeing the decor. I am definitely a perfectionist and sometimes it makes me crazy! I like planning and having everything just right. I am a perfectionist which makes my stress level go up because I am worrying about everything. I ended up a nervous nester…which makes me laugh since I am not a nervous person in general! My hosting style was “The Perfectionist”. 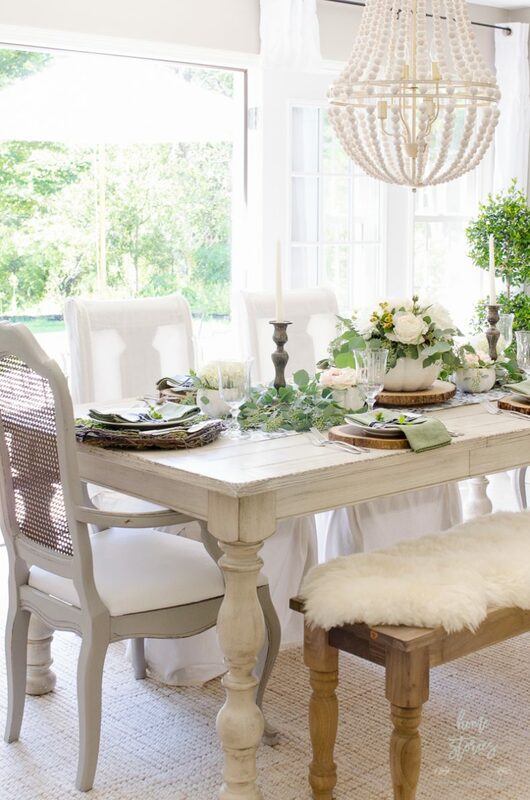 This style impacts my gatherings by ensuring that everything is super organized. I have my list and I am checking it twice! I’m a Perfectionist too. I can really get stressed over hosting and even more stressed if I delegate some aspect to someone else. I’m working on it. Love your prize pack! And can’t agree more that we need to part with our perfectionist selves! I assume I am a perfectionist entertainer as well because often just the thought of all the work involved makes me want to go lie down. I have a thing or two to learn! Lovely prize package.